Multi purpose leather bag made from weathered goat leather and lined with durable canvas and high quality accessories, our IPAD bag gives life to your idea of the perfectly handy messenger bag, fits your ipad, phones, documents and the little extra things for daily use..... With a very unique and vintage look our bags come with user friendly features the features are 3 internal compartments ( one large center compartment for carrying books/ IPAD etc and 2 small ones for books/ documents etc))2 zipper pockets for important documents etc, 1 front pocket for mobile /accessories etc..... The other Features are: Genuine Vegetable Tanned Goat Leather Adjustable shoulder strap durable canvas lining Size 11" H x 9" L x 4"W NOTE: Goat leather used for these bags is still processed in the traditional ways that have been around since generations. It is not processed by use of chemicals or dyes but by traditional methods of sun tanning and hand done vegetable oil polish. The leather gets softer with age and develops a unique texture and finish. Also because of the natural tanning processes the leather bag could have a distinctive smell that fades away with days of use. Since all bags are individually handmade they are all unique. Since all hides are different, no two bags will be exactly the same and may vary slightly from the pictures. EASILY ORGANISE YOUR BELONGINGS: The tote bag features a spacious main compartment that includes an padded laptop sleeve protect your notebook or iPad, tablet from scratches. A zippered RFID BLOCKING pocket can prevent your wallet or cards from identity theft. 2 open pockets, 2 mesh pockets can well organize your Ipod, comestics, pens,headphone, keys. LUGGAGE/SUITCASE:Backside is a removable tab for suitcase. You can put it on when it's a travel bag or hide it in the interior bottom when it's not necessary for you. 1 Year Guarantee for ZIPPER, STRAP, ANY QUALITY ISSUE that affect your use of our product. USA GEAR S7 - Quality Protection with Style! Rugged Design - Stop worrying about protecting your tablets and games! The S7 features a high-density Ripstop Nylon exterior that cushions your belongings , constructed so your bag can take a beating while your games rests safely inside. The bag can withstand a variety of conditions , ranging from heavy winds , long sun-exposure , sand , dirt , and even mud! The interior comes fitted with thick , durable padding on all sides to offer cushioning from every angle! Easy to Adjust and Customize - The bag has a large opening top for easy access to your cards and books , as well as an adjustable FlexWall Interior to offer you a variety of different storage options. The FlexWall is an adjustable and removable system that can be reconfigured to fit your needs and store your gear in secure customized partitions. 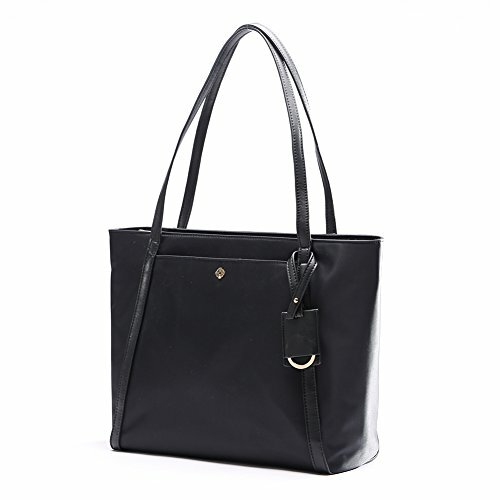 The bag also features a convenient carry handle and detachable shoulder strap for a comfortable fit and secure carrying. Plenty of Storage - This carry bag boasts a large interior as well as two extra accessory pockets , one internal and one external. The large amount of storage space allows you to store your device and a variety of other accessories , ranging from chargers , batteries , tablets , headphones , cases and more! INTERNAL DIMENSIONS: 11 in x 7.8 in x 4.1 in. Works with. Nvidia SHIELD Tablet , K1 - Wireless Shield Controller - Nvidia DirectStylus 2 , SHIELD AC Adapters , Stand , Cables , Chargers , Accessories..and many more! This leather bag has been handmade from the finest goat leather with a durable inner linings made of canvas. Every bag has been individually handcrafted giving each one unique markings and colourings. The sturdy leather is tanned without the use of chemicals and dyes and it softens and darkens naturally over time. It is tanned by using natural oils and light. 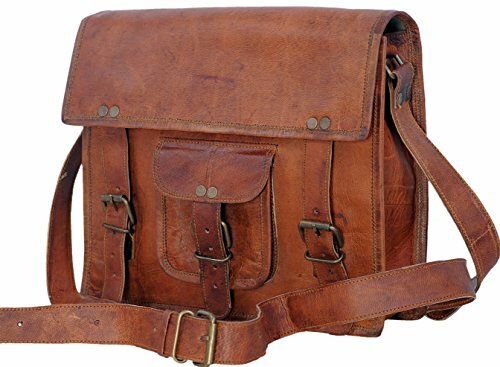 With timeless vintage leather look and feel, this attractive bag will never go out of style, infact these bags are currently very much in style. 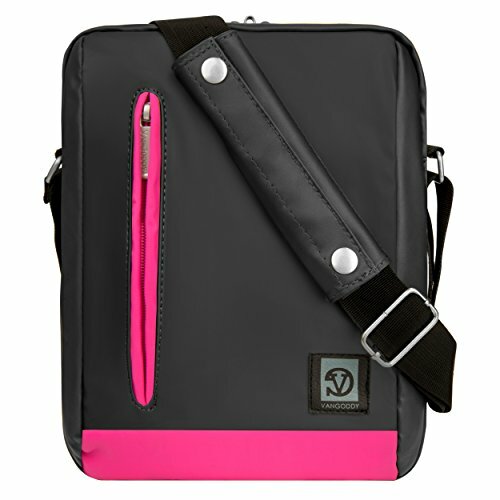 It is designed to carry laptops, tabs, documents, books, etc. Stand out from the crowd with this retro, rustic, attractive and timeless bag. This is 100% original and authentic. 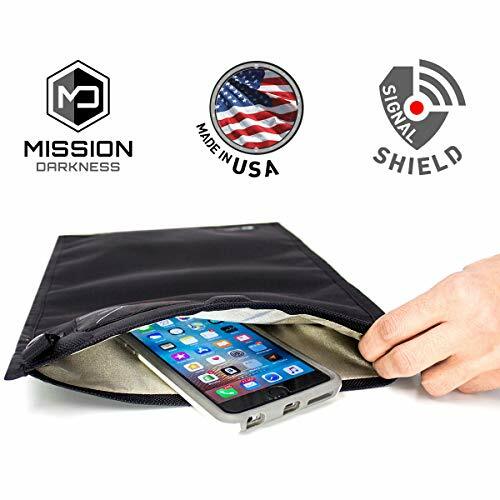 The Mission Darkness NeoLok Faraday Bag completely blocks all wireless signals and keeps medium sized electronic devices shielded to prevent hacking, tracking, spying, and chain of custody corruption. When a cell phone or tablet is properly enclosed in the bag, no apps or malicious code can be remotely triggered or wiped, no communication can penetrate, and no one can access the microphone, camera, GPS location, or data. The NeoLok closure system allows an operator to effortlessly close the bag by way of a double roll and strong magnetic seal holding the roll in place. A quick-snap strap over the roll provides extra closure protection. The quick-snap strap should be used when transporting the bag, but can be undone upon introducing the bag into an analysis enclosure. From there, the user can easily open the bag with a glove one-handed if need be. This is a feature primarily designed for forensic investigators, eliminating the risk of puncturing an analysis enclosure glove with scissors (often used to cut a faraday bag open) or harsh Velcro (used in standard faraday bag closures). 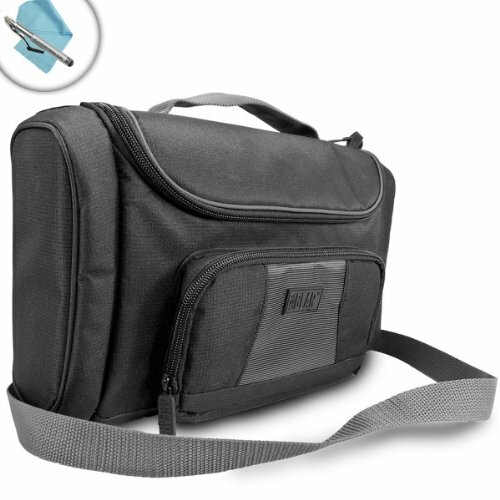 The NeoLok Faraday Bag offers extreme device protection, security, and ease of use. It is compatible with Mission Darkness analysis enclosures such as the BlockBox Lab, BlockBox Touch, and the BlockBox Touch USB. MILITARY GRADE FARADAY BAG: Designed for law enforcement forensic investigators, executive travel, personal security, EMP protection, and solar flare protection. Two layers of high-shielding fabric on all sides with dual paired seam construction. 100% SIGNAL SHIELDING: Blocks WiFi (2.4 & 5GHz), Bluetooth, cell signals (4G LTE+), GPS, RFID, and radio signals with 60-80dB average attenuation. NEOLOK CLOSURE SYSTEM: Effortlessly close the bag by way of a double roll with a strong magnet seal, plus additional quick-snap closure strap for ultimate security and signal blockage. ADDITIONAL FEATURES: Uniquely serialized for asset tracking; closable pocket on back to place agency information; water-resistant ballistic nylon outer materials. The VanGoddy Adler is a simple yet productive tablet case that offers a utility of features for ever changing lifestyles. The exterior features a Vinyl and PU blend that retains its durability and provides a stylish look. The front of the exterior features a vertical zippered pocket and on the back we have a large slip pocket with closure; both make for quick access to desired items and accessories. The interior features a dedicated tablet compartment for keeping your device safe, separate, and protected. Also featured in the interior is ample storage space for notebooks and small items and a dedicated zippered mesh pocket keeps cables and cords organized and tangle free. This bag can be worn comfortable on the shoulder thanks to the adjustable padded shoulder strap; did we mention that this bag also features anti theft? That's right, our zipper pulls feature interlocking dual zippers that can be fastened with a lock of your choice. All of these features come nestled compactly in a slim unibody with endless possibilities, experience it for yourself today. This leather bag has been handmade from the finest goat leather with a durable inner linings made of canvas. Every bag has been individually handcrafted giving each one unique markings and coloring's. The sturdy leather is tanned without the use of chemicals and dyes and it softens and darkens naturally over time. It is tanned by using natural oils and light. 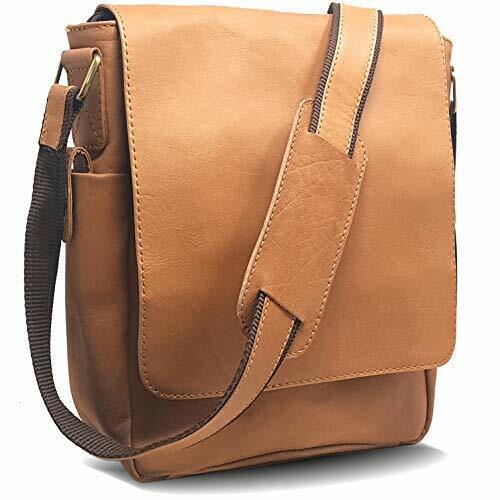 With timeless vintage leather look and feel, this attractive bag will never go out of style, infect these bags are currently very much in style. 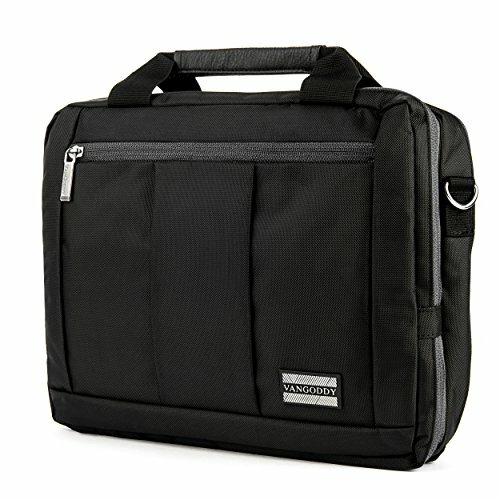 It is designed to carry laptops, tabs, documents, books, etc. Stand out from the crowd with this retro, rustic, attractive and timeless bag. This is 100% original and authentic. 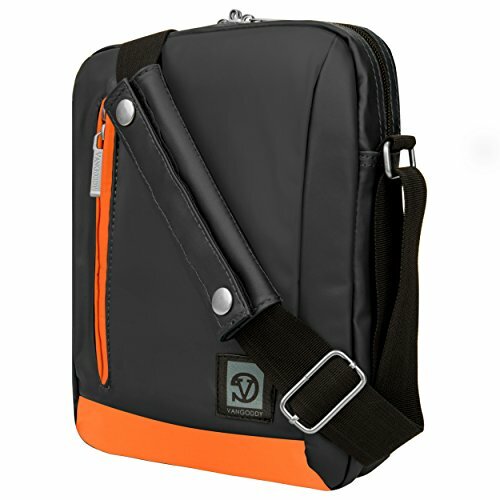 This classic, innovative protective laptop shoulder sleeve bag is perfect to carry and protect your laptop and accessories for your work, college, travel, and other applications. 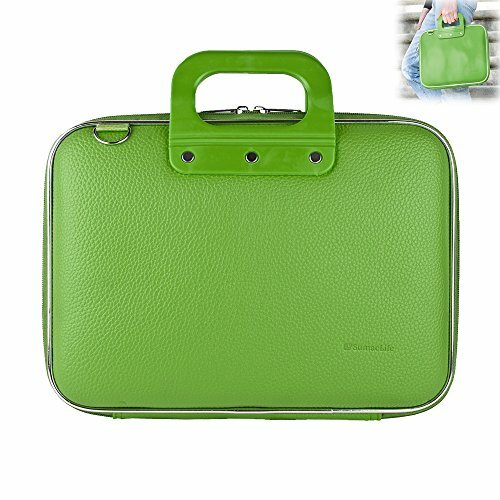 Fashionable and decent look, comfortable and convenient to carry, whether for business or leisure, it is beyond perfect. It can also be used as a travel gadget carrying bag, or even used as a fashion accessory. Deluxe, high-end design and top-quality materials combined with practicality and general usefulness make the shoulder bag an essential purchase. PREMIUM MATERIAL WATERPROOF CONSTRUCTION: High quality vegan leather hard shell case with silky smooth polyester lining provides ultimate protection for your device against dirt, wet, spills, scratches and bumps. 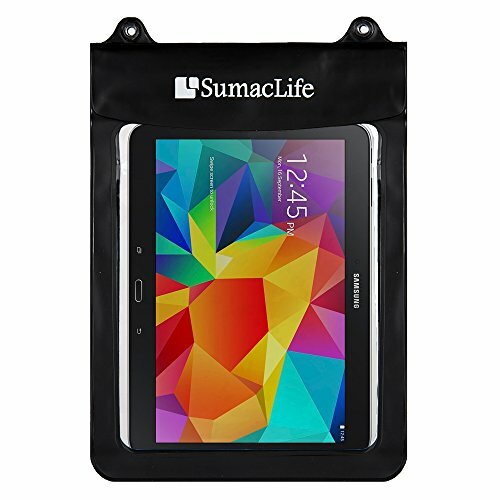 Created with a fashionable and professional way, this tablet bag is durable, waterproof and shock proof. Perfect for work, college, travel and daily use. 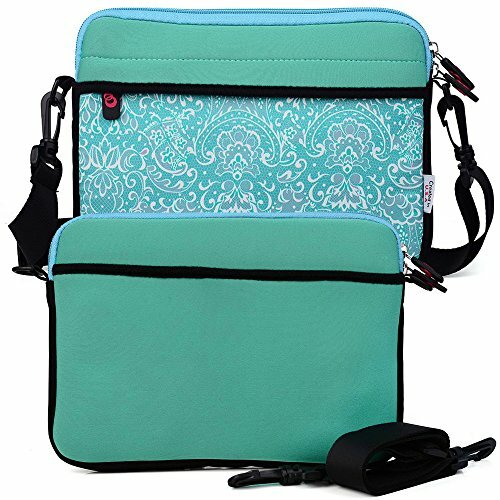 LARGE CAPACITY WITH ORGANIZER POCKETS: Big zippered compartment with built-in elastic straps to keep your laptop in place. Accordion style holder to hold books, folders, tablet etc. Mesh pockets to store cell phone, earphone, pens, cables, USB hard disk and other accessories. Keep your essential accessories neat and organized in this compact briefcase. 3-IN-1 DESIGN: Comes with an adjustable and detachable shoulder strap allows for easy carrying. Slim and lightweight, this laptop shoulder bag can be easily converted into laptop sleeve bag, messenger bag, business briefcase and handbag. Dual zippered closure can be fully opened at 180 degrees. Top-loading zippers glide smoothly and allow quick access to your devices. Sturdy top handles make it easy to handle and carry. DIMENSION: External Dimension: 15.5 x 12 x 3 inches. Internal Dimension: 14.5 x 10.75 x 3 inches. 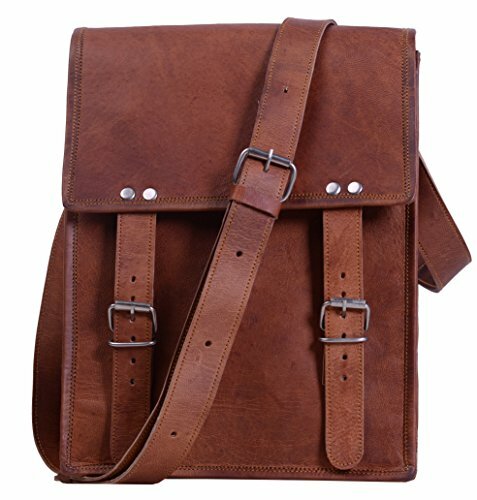 This stylish laptop and tablet shoulder sleeve bag with handles for men and women is custom made for 13.3 - 15 inch laptops and 2-in-1s. COMPATIBILITY: Perfect fit 15 New MacBook Pro with Touch Bar Late 2016 - 2018 (A1990 A1707), also compatible with Lenovo 14 ThinkPad T-Series/X1 Carbon 1-4th Gen/X1 Yoga | HP Acer Chromebook/ZBook x2/Envy 13t/Spectre x360 | Acer Chromebook R13/Swift 7 | Asus VivoBook E403NA/ZenBook Flip 14 | Dell Chromebook 13/Inspiron 13/XPS 13 | Microsoft Surface Book, Razer Blade, Samsung Notebook 9 Pro, Toshiba Chromebook 2/Satellite Radius 14 and more. * Materials - External Material: Stylish suit fabric-like material. Internal Material: Bubble neoprene interior. Please Note: This is a universal case and is NOT made for a specific model. actual device measurement and should be slightly smaller than the max internal diagonal and ensure fit your device before purchase. 9.7" / 10.1" / 10.5" SERIES : Universal design compatible with many popular 9.7 to 10.5-inch screen sized tablets from Apple, Samsung, ASUS , Lenovo , Dell, Toshiba, Google , Sony, iRULU , LeapPad, FUHU, ClickN, OLPC, Dragon Touch, Boogie Board, Matricom, ProntoTec, Alldaymall, Allwinner & many more. Universal standard fit depending on the size of the device. COMFORT & CONVENIENCE: Removable/adjustable shoulder strap for easy wear and carrying convenience. PU leather handle grips for comfortable carry. Perfect carrying option when traveling, commuting, or going to classes. Great for home storage, work, school, or internships. PREMIUM MATERIAL: Heavy duty stitching and hardware, the main compartment is lined with thick water resistant neoprene with a foam bubble padded layer for greater protection and shock absorption. Water resistant material offers protection from water spills and light rain. STORAGE & ORGANIZATION: Two generous exterior front and back pockets to store essential accessories. 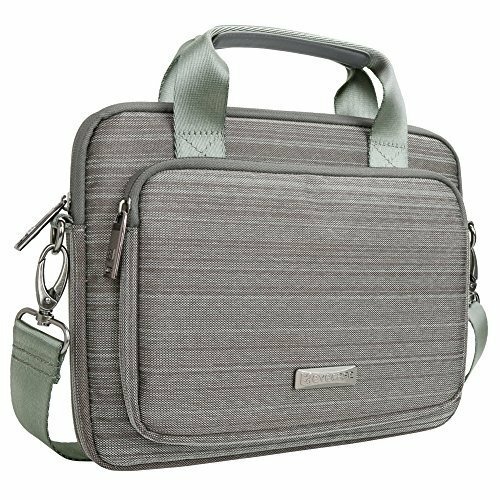 Front zippered pocket with organization panels inside for the power cords, smartphone, business essentials, or even small tablet. You are modish and swanky, youthful yet matured. A trendsetter, you are free-minded and live to challenge convention. This bag is tailored for the influencer that's you, who is as charming outward as he is within. It's a style that will grow with you as it will on you and on those around you. 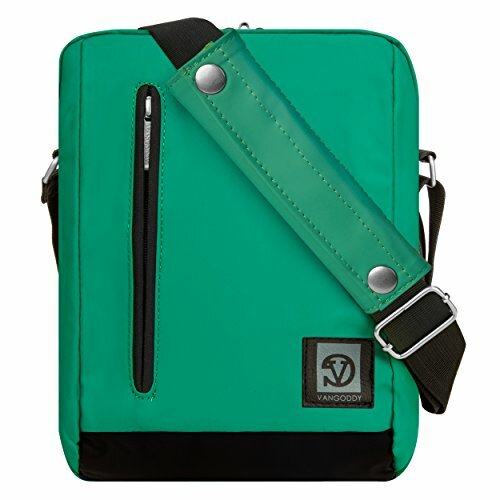 This convenient and practical tablet bag can be carried as a cross body bag by using the removable strap or as a protective sleeve to put away at when you are done playing games, chatting or browsing the web. Can be carried inside your laptop bag, briefcase, luggage or backpack. Made of fine washable and semi waterproof neoprene. This sleek looking bag closes with two-way top zippers for easy access. Front nylon double-pockets on the outside will allow you to carry extra accessories including but not limited to your mobile phone. Backside features one more neoprene pocket for small documents. Samsung Galaxy Tab Pro 8.4, Tab Active, Alcatel One Touch Pixi 3 (7), Acer ICONIA A1-830, Asus VivoTab Note 8, Apple iPad Mini Retina, Mini 2 3, PiPo W2, ARNOVA 7f G3, Azpen A721 3335, Asus Asus ZenPad C 7.0 Z170MG, MeMO Pad 7 ME170C, ME176C, Asus MeMO Pad 7 ME176CX, Nvidia Shield Tablet, Lenovo A8-50, Lenovo ThinkPad 8, Yoga Tablet 2 8.0, Lenovo Tab S8, Dell Venue 8 (2014), Dragon Touch M7 7 inch, Acer Iconia W4, Sony Xperia Z3 Tablet Compact, Linx 8, LG G Pad 8.3-inch, HP Slate 7 Stream 7, Lenovo Tab 2 7 Inch A7-10 A7-30, LG G Pad 7.0 8.3, Linsay 7 Inch Google Android, Asus ZenPad S 8.0 (Z580CA), ME181C MeMO Pad 8-inch, Toshiba Encore 8-inch, Michley Tivax MiTraveler 7 Inch Capacitive, O2 Super Pad, PiPO P68 T1, Huawei Honor Pad 8 Inch, MediaPad T1 8.0 Pro 4G 8 inch, MediaPad M1 8.0 8 inch, Samsung Galaxy Tab 3 and 4, Tab 3 Kids, Samsung HomeBoy Galaxy Tab 3 7.0, Scout 7 Inch Android, Tagital T7X 7, Amarelec 7 Inch, Visual Land Prestige 7 7L, Pro 7D, Xelio 7 Inch P717A, ZeniThink C71A, Amazon Fire HD 6, 7 Inch HD Tablet. This laptop sleeve may also fit some of the most known manufacturers like Apple, Dell, Lenovo, Acer, Amazon, Asus, Google, HP, RCA, Vizio, LG, Microsoft, Samsung, Sony, Toshiba. Please refer to internal dimensions listed above. Full length pockets on both sides for your Wallet, iPod, Earbuds, Small External Battery, Cord, Glasses, Pens, Smartphone etc. Description: 100% genuine leather with durable inner canvas lining and steel accessories........ Size 11" width x 9" height x 3.5" depth. 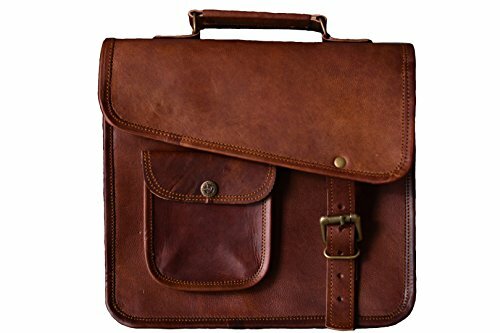 Well suited to carry I pad's, Books and other personal belongings etc......... Genuine handmade product made from chemical and dye free leather.......... Veg tanning using natural edible oil and Sun tanning used for obtaining shades........... Bag gives a wonderfully unique and antique look with use............ A perfect companion and gift for your close ones. NOTE: Recently we found a lot of cheap replicas in the markets that using worse materials and workmanship to attract buyers ,lot of buyers complained the bad quality coz they selected those ridiculous offers. in order to get a top quality bag, please be careful to select other offers. Please check the brad name before buying the product. 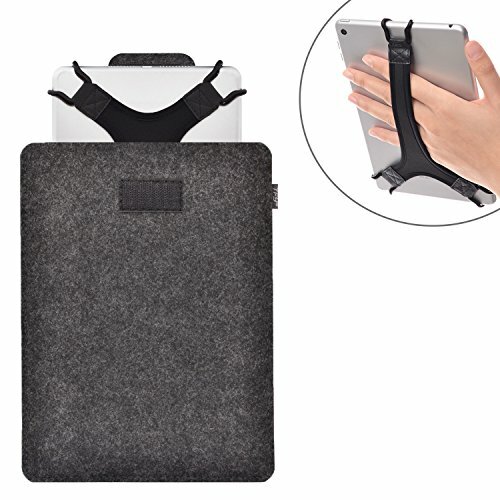 Specifically designed for use with iPad Air / iPad Air 2 / iPad Pro 9.7" / iPad Pro 10.5" / iPad 2/3/4 9.7" / Samsung Galaxy Tab S2/S3 9.7" / Tab A 10.1" / Tab A 9.7" / Tab S 10.5 devices. Provides comprehensive protection for your device - from scratches, screen smudging, etc. Devices easily slide into and out of the pouch and are retained securely by hook-and-loop closer with synthetic leather tab. Pouch easily stows into a briefcase, backpack or other type of bag. Pack includes bonus hand strap to improve holding comfort and security when using your device. VanGoddy El Prado Collection, 3 in 1 Tablet Case; durable, fashionable and functional. Safely carry and transport your laptop or tablet in 1 of 3 ways. Carry your device and other belongings in the backpack style to free up your hands. Use the messenger bag style to carry your belongings safely by your side or remove the strap and carry the briefcase in a traditional way. 3 different styles with just 1 bag to minimalistically fulfill your needs. Shock absorbent interior and water-resistant nylon exterior protects your device and belongings from damage. Accidents happen often but with this bag, your device will be protected from drops and bumps. A surprise rainstorm or spilled drink is no match for the El Prado. Multiple accessory pockets enables you to carry a wide range of devices and accessories. Along with your laptop or tablet, carry books, notebooks, folders, documents, or anything else you need at work or on campus. Extra zipper on the front of the bag to store and easily access even more of your belongings. Perfect for your phone, wallet, keys, pens, chargers, headphones, and any other small yet important possessions. 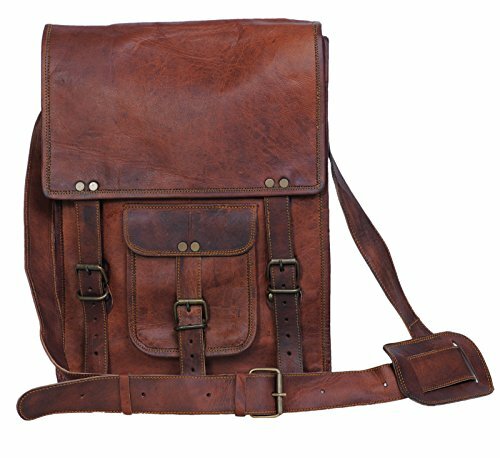 This genuine leather messenger shoulder bag is made up of goat leather which is meant to be soft , supple yet strong. This small satchel is handmade and hence may not have machine like finishing. As we know that handmade items are more charming and durable than mass produced items, we can assure a long life of the product. The leather being treated naturally MAY sometimes have some odor which fades away in just a few days use and in no case is the odor permanent. Since the bags are tanned using natural oils, the oil is applied by hand and hence no bag has identical color or texture making each bag distinctive. The color of the bag may slightly vary due to its above said nature and also due to inevitable computer screen differences. The color of the product gets darker with use and with time the product gets as darker (Or more) as advertised. 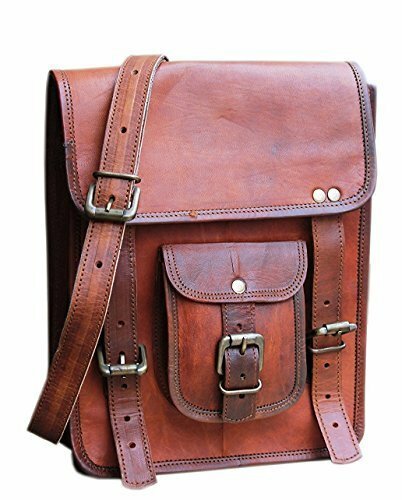 The Leather used for this crossbody leather satchel is full grain soft goat leather. 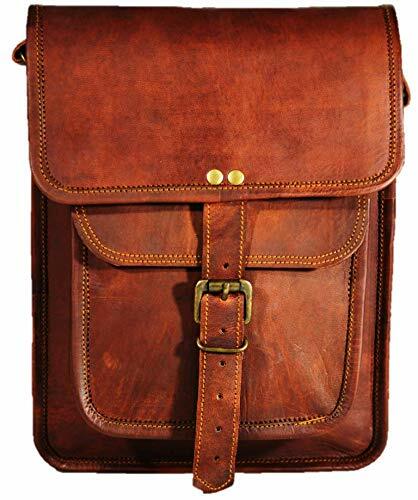 Full grain leather retains the scars / marks on the goat skin giving each bag a vintage look & different look.